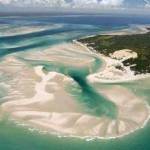 This wonderful Mozambique safari holiday combines Big Five game viewing in the Kruger Park in South Africa with a vacation on beautiful Bazaruto Island. Fly in a light aircraft to Vilanculos, continuing by boat to Bazaruto, where you can enjoy water sports, spa treatments, snorkelling at Two Mile Reef, diving & deep sea game fishing. All transfers, game drives & local flights included. You will be met at Mpumalanga Airport and transferred 3-hours to your game lodge in the world famous Kruger National Park. After checking in, enjoy a thrilling game drive in an open-top vehicle accompanied by a lodge ranger. Game viewing opportunities should present themselves almost immediately in this vast wildlife wilderness. Hopefully you will see several species of antelope, zebra, wildebeest and maybe even giraffe - as well as several of the Big Five - before dining under the stars in the atmosphere that only the African bushveld can provide! Rise at dawn to take advantage of the best game viewing conditions of the day, as you enjoy thrilling shared open-top game viewing drive with a lodge ranger in the world famous Kruger National Park. Explore some of this vast game sanctuary that is the size of Wales, offering magnificent game viewing opportunities and the highest concentration of lion in the whole of Africa. Hope to see several of the Big Five today - lion, elephant, buffalo, leopard and rhino - as well as many other species before returning to your lodge for breakfast. The rest of the morning is free to relax by the swimming pool or enjoy bird watching at the lodge, before setting out again in the late afternoon for another game drive. With nearly 150 different species of mammals and over 100 species of reptiles in the Kruger National Park, you can hope to see cheetah, giraffe, hippo, kudu, crocodiles, sable antelope, waterbuck, warthogs, baboons, wild dogs and many other interesting animals. With over 500 different bird species including eagles, kingfishers, vultures and storks, outstanding bird watching is also guaranteed. After a final early morning game drive in the Kruger National Park, transfer 3-hours to your hotel on the scenic Panorama Route. There are many activities available in this region, including the elephant sanctuary in Hazyview and the chimpanzee sanctuary in Nelspruit. Also day tours of the Panorama Route, several golf courses and many beautiful walks, with outstanding bird watching. Transfer to Mpumalanga Airport for your onward flight. You will be met at Vilanculos Airport and transferred to the landing for your boat transfer to Bazaruto Island in the spectacular Bazaruto Archipelago. Please note some wading may be required, so dress appropriately. Check in to your beach lodge, settle-in and relax on this warm Indian Ocean island, with its vast unspoilt beaches fringed by palm trees. Enjoy lazy days swimming in the warm turquoise waters of the Indian Ocean, sunbathing on deserted golden beaches and snorkelling off the beach amongst fish of all descriptions. You have unlimited access to all non-motorised water sports, which varies by resort but usually includes snorkelling, windsurfing, canoes, body surfing and hobie cats. Scuba divers can explore the pristine Mozambique Reef in warm water and fishermen can try their hand at light tackle, fly-fishing or exhilarating Deep Sea Game Fishing, in waters considered to be the best for Marlin in the world. Enjoy long walks along the endless golden beaches as you explore your island, with its prolific bird life (over 100 different species, including flamingos and pelicans) or simply relax and enjoy the warm sunshine under endless blue skies. Each evening enjoy a romantic dinner and understand what it means to be in paradise! Transfer by boat to Vilanculos Airport for your flight home.